We all know that ordering from US retailers isn’t the easiest thing to do for Canadians. That’s why here at Kinek we’ve worked hard to set up package receiving locations at nearly every major border crossing between the US and Canada. Canadian’s can use these border KinekPoints as their personal US Shipping Address to receive packages from US retailers and avoid having to pay international shipping or brokerage fees. The popularity of this service hasn’t gone unnoticed and one of our newest e-commerce partners in the US, Sierra Trading Post, is offering a time-limited exclusive offer to all Kinek customers. 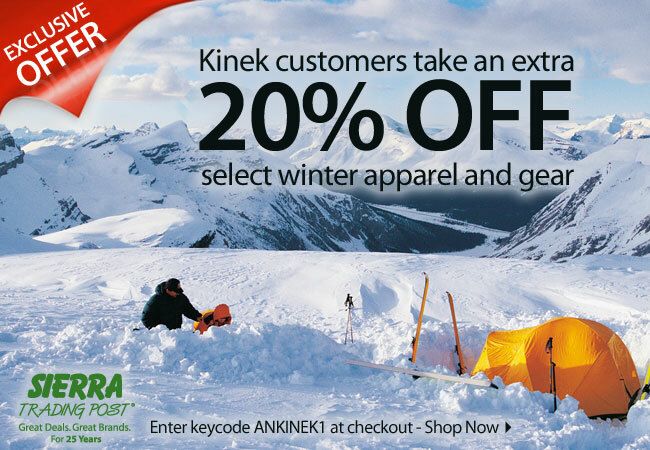 Until November 10th, Kinek customers can get 20% off by using the promotion code ANKINEK1 during their checkout at Sierra Trading Post! Getting 20% off from any retailer is a great deal, but when you consider that Sierra Trading Post already offers some of the best deals out there, it makes this an incredible offer. Sierra uses the tagline “Save 35-70% off every day” and they aren’t joking around. No matter what day you check their site you’re going to find a great deal on top-brand items. Their specialty? Outdoor gear, clothing, shoes, and home decor. With brands like Columbia Sportswear, The North Face, Keen, ExOfficio, and Merrell, you need look no further.